No, it's not the start of the "Christmas Waltz". It's a reference to what my front window looked like yesterday. The outside temperature, when I got up was -8. Mercifully, the wind had died down and was only 10-15 mph with the occasional gust up to 20. On Sunday, I decided to cover the north window in the living room. I got the plastic all taped to the window frame and, almost instantly, the room seemed a whopping 10 degrees warmer. All the windows covered with plastic are clear. 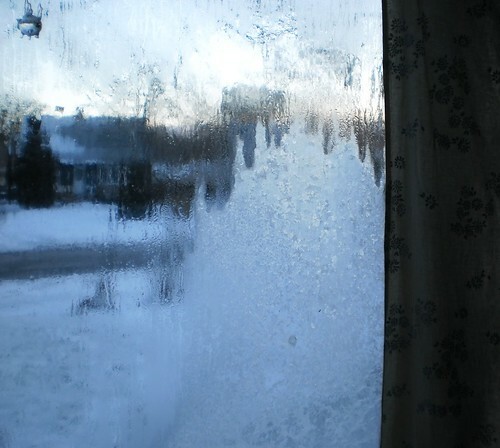 The big picture window and the small window in the NE corner of the living room, both of which aren't covered in plastic, had this frost on them. The kitchen windows did too, but I can't cover them with plastic. I just don't spend time in the kitchen when it's cold. I didn't realize how leaky that north window actually is. My whole house just feels warmer having covered it. I'm debating about covering the big picture window. I don't feel a draft around that window, but that doesn't mean there isn't one. Plus, covering the window would ensure I can see through it on these frosty mornings. I remember, on the farm, we used to scratch our names in the frost on our windows. You'd shrug when there was a draft. The heavy plastic was nailed to the side of the house on the outside of the windows and hay bales were stacked against the foundation, all in the name of warmth. I'm glad we've progressed to lightweight plastic that does the same thing the heavy, almost opaque material did. It was unsightly but most every farmhouse had it on the first floor windows. Some farmers put it on all their windows. I have enough film that I could cover that window, but I am on the fence. The resulting frost was quite photogenic and the living room is nice and warm now. Plus, I don't spend time in there at night when it would be the coldest. Yet, every bit of warmth kept inside is less gas used. In the end, once I'm done with the packages and parcels on the front window, I'll probably cover it. If the winter is going to be anything like the end of fall here, and remember, this blizzard has happened at the end of meteorological fall, I will be glad I did. Oh and, in case you're curious, here are the words to "The Christmas Waltz". Harry Connick Jr, Frank Sinatra and Johnny Mathis do very nice versions of it.